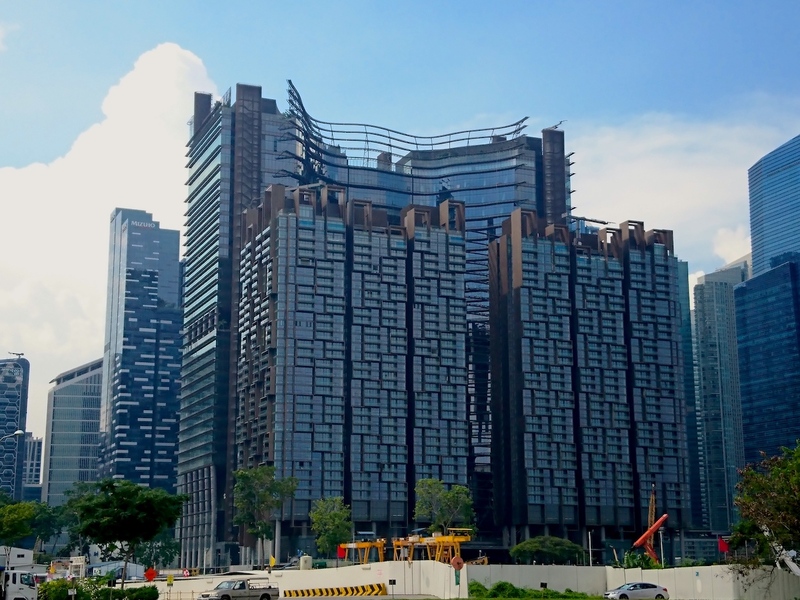 Marina One is a landmark building at the centre of vibrant new growth for residential, commercial and lifestyle activities in the Marina South area of Singapore. The building encompasses two residential towers and two grade A office towers which are all joined together by architectural louvres designed to resemble the layers of terraced rice fields. This creates a central podium space, known as The Heart, which houses retail space with lush greenery and landscaping from the team behind the nearby Gardens by the Bay. These exciting features make Marina One the embodiment of Singapore’s dream for the city to combine living, working and leisure spaces, with the ‘City in a Garden’ concept providing a sanctuary and green space of waterfalls and rooftop gardens for communities amid the hustle and bustle of the CBD. The client needed to ensure full facade coverage with the most practical and cost-effective system possible. The local architects were particularly thorough in their requirements for the building maintenance system and, having successfully worked with CoxGomyl on a previous project, were confident of receiving a high level of detail in communications and a relationship of trust with the Project Manager. The access system for this unique four-tower construction and gardens called for an equally individual, bespoke solution. The particular challenges included the irregular shape of the building, which changes dramatically at each floor and features many protrusions: both within the interior formed by the linked towers and on the outer facade. The all-important green spaces also required full access on various levels. 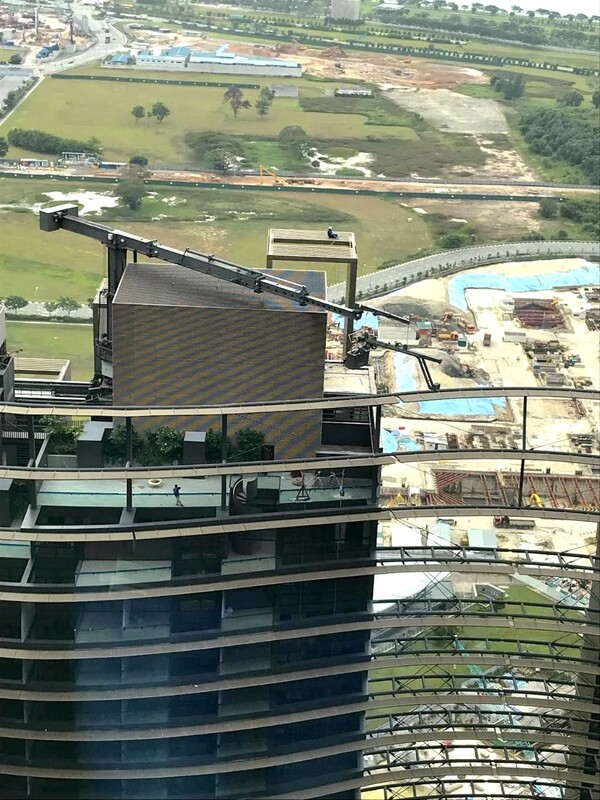 The two office towers are each serviced by a 5000 Series BMU, featuring a telescopic mast and telescopic jib with an outreach of 12.5m. 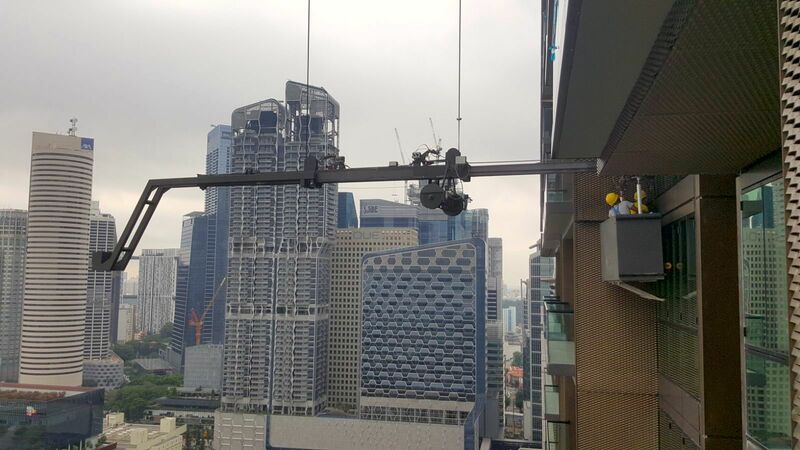 The two residential towers are each accessed with a 7000 series BMU with a similar telescopic mast and a telescopic jib with a longer outreach capability of 30.5m. These travel on I Beam tracks and provide interchangeable cradles for standard, offset and forward-approach working. The fifth BMU is a 7000 Series underslung machine with an outreach of 6.75m which services the interior space created within the middle of the four towers. This is lowered from an ‘upside-down’ platform at the upper levels onto tracks below. 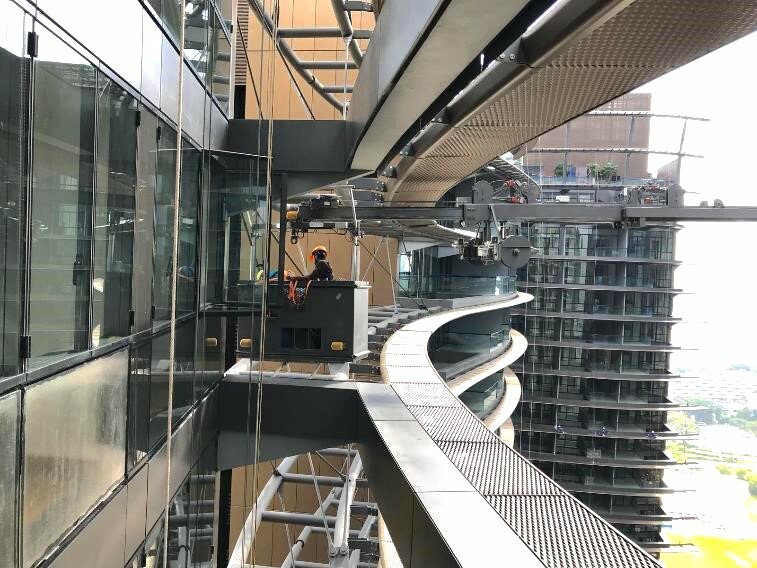 It also features a special rescue trolley which doubles as a launch for a davit arm to reach three floors above a 170m drop. The comprehensive building access solution is completed by four monorail systems, box ladders and single track ladders to provide quick access to the numerous recesses, along with various restraint sockets, anchor points and access shelves to ensure full coverage of even the most hard to reach areas. CoxGomyl were able to present a truly full-coverage building access solution. This, combined with forging productive relationships and effective project management, meant the client was satisfied the system would meet their high demands for functionality.